Looking for solutions to fill the restricted PDF forms? Here you have the Perfect solution. The user cannot edit the forms that are available online as they have restricted access. Once the tool loads the PDF form, it removes the restricted access from the PDF forms. The user can then open and edit fill adobe PDF forms easily. 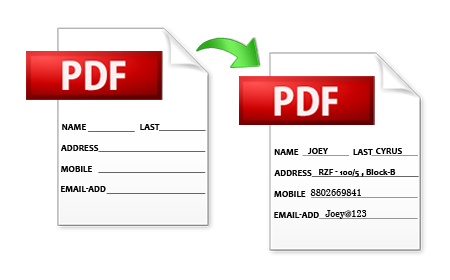 Once the user fill up PDF form with details completely, he/she has the option to save it as a PDF file. The created PDF file again has the restricted access of editing, printing and copying. This makes the file secure again for the user. The software provides the option to change or replace the data filled in the PDF forms with completely new data. It extracts the data from PDF form and this data can be used for creating a new PDF form with its own distinctive data. The software provides another option with which the user can clear out data from different fields of the filled PDF forms and fill the form again. In order to make the contents of PDF clear, the user has the option to zoom in/out the screen according to their requirements. The software comes with a simple user interface which will help you go through the process in four easy steps embedded in a single panel. Even a non-technical person will able to understand the steps and run the software successfully. Once the PDF form gets filled up, the software allows the user to save the created PDF file in a desired location of their hard drive. The user can even save the PDF file by creating a new folder. The trial version of the software is available for the user. The limitation with the demo version is that output PDF file will have the prefix attached to every field in the PDF file in addition to the watermark. Economical Licensed Version: Order Now! To get the full functional benefit of our software, go for the licensed version. The licensed version of the tool is available to users at a very economical price. We provide you the option to do transaction through trustworthy payment gateways. Can I use this software to edit the contents of PDF form? You can only edit the contents which have been asked to fill i.e. the white spaces. Can I use this product with Windows 8 operating system? Yes, you can run this product on all Windows OS editions that include Windows 8. Can I use the trail version to see how the product works? Yes, the trial version is available for the user but with the freeware, the output PDF file will have the software name as prefix attached to all fields entered in the form. Are my documents safe after filling the PDF form with the PDF form filler? After filling the contents of the PDF form, the software saves the Form with again restricted access. So your data on the form remains protected and secure. What happens if I fill the wrong contents in the form? If you want to change the contents, then the software comes with the handy option of clearing out the fields mentioned in your PDF form. Then you can again refill the form. Thanks a lot! The product is so efficient that I don't need to manually fill it by pen anymore. I can fill in Adobe PDF form using the desktop itself. This is ideal software for business communication because our company does not have to scan the forms for filling it up. My handwriting is really bad and this product gives me a better solution of filling up the job application form electronically.